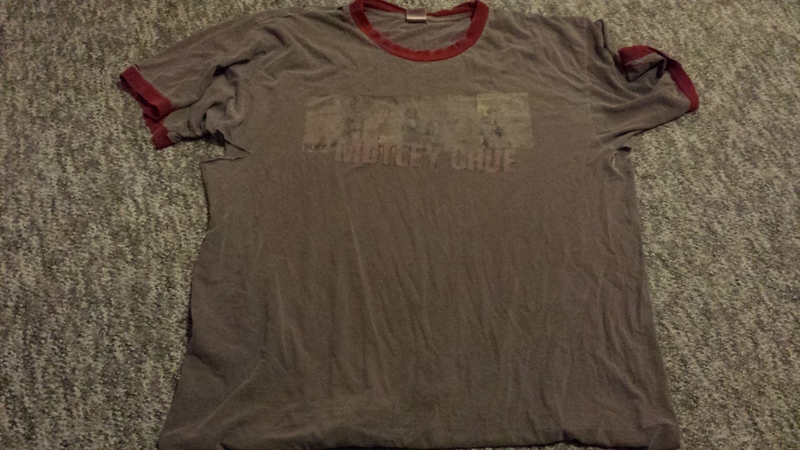 Well, it’s had a good 10 year run, but it’s time that I retire my Motley Crue shirt that I picked up on the band’s Carnival of Sin tour back in 2005. Over the years, the shirt became one of my favorite shirts to sleep in but it’s become too ripped and ratty to continue on. It’s become pretty faded as well but that doesn’t bother me as much as the large holes in the armpits! Bought this album for three reasons: “If I Die Tomorrow”, “Sick Love Song” and “Street Fighting Man”. Before anyone thinks I’m stupid for spending $15-20 for 3 songs, I actually picked up a used copy off Amazon.com for about $2.25. Red, White & Crue is the band’s fourth compilation and came hot on the heels of the reunion of all four original members. This time it was Tommy Lee returning after having had some minor success with his rap-metal group Methods of Mayhem and two solo albums. The late Randy Castillo (ex-Ozzy) was Tommy’s replacement in the band and later when Randy became ill, Hole drummer Samantha Maloney would join the group in a touring capacity. For my money (as little as I paid! 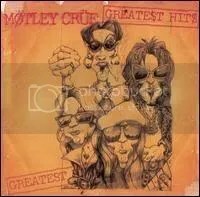 ), this album stands as the superior Crue compilation. Of the 5 compilations the band has released, this is the only collection to feature two discs (although a single disc version was released) and therefore it’s able to cover a lot more ground. It certainly makes 1998’s Greatest Hits album obsolete as it includes the two new tracks that came from that album. Quality begins to take a dip with Disc 2 as the collection is set up in chronological order and we’re taken through the Corabi album, Generation Swine and New Tattoo songs. The album ends on a high note with three new tracks. “If I Die Tomorrow” and “Sick Love Song” are classic Crue songs in my opinion and were foreshadowing what would come later on Saints of Los Angeles. Great mix of modern hard rock and the classic Crue sound and two of my favorite Crue songs ever and in my area they both got some decent airplay. The final new track is “Street Fighting Man”, a cover of the Rolling Stones song (and Josh Freese actually plays drums on this song). A good effort though I’m not a big Stones fan. A fourth new track called “I’m a Liar (And That’s the Truth)” made it onto Japan pressings of this album. I checked the song out on YouTube and while it would’ve been nice to see it included, it’s the least pleasing of the newly recorded songs. Kinda generic. For old school fans, there is the previously unreleased “Black Widow” (You mean there are MORE songs that didn’t make it as bonus tracks to those reissues ) which was demoed in 1983 for Shout at the Devil but morphed into “God Bless the Children of the Beast”. Listen, anytime a band releases a “best of” or “greatest hits” compilation, the debate can rage on endlessly about which songs didn’t deserve to be on the album and which songs did. Sure, we can all sit back and pick this album apart and list what we’d take out and put in but I think this is a great career overview, warts and all. They didn’t focus only on songs from the original four members, they didn’t try to pretend Corabi didn’t exist or that they didn’t go that weird alternative/techno route with Generation Swine and I think that’s cool. 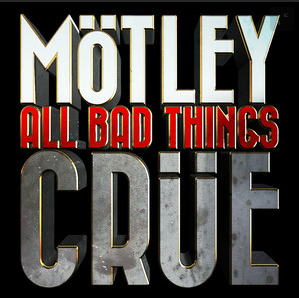 For better or worse, this album shows you all eras of Motley Crue… which is what a compilation should do, in my opinion, unless you’re calling it a greatest hits album. This is the compilation I would recommend to anyone looking to get into the band. More than likely, the most amount of enjoyment is going to be found on Disc 1 as every song there is classic old school Crue but Disc 2 still has a few gems to offer. This isn’t one concert, it’s a cut & paste job of performances taken from the 80s and late 90s. Having actually seen Motley played live TWICE now, I can say this album does them no justice at all. I used to enjoy it when it was first released, but it just can’t compare to their live show. There’s no doubt that all live albums get a little “touch up” in the studio, but I think Vince’s voice in concert today sounds better than some of his parts on here. Good song selection though, there’s a strong presence of early material and “Ten Seconds to Love” is a great live cut. This is Motley’s 2nd compilation, coming 7 years after Decade of Decadence. And do you want to know what got me to buy this album? The World Wrestling Federation! That’s right! Motley did a live performance on WWF TV (on either Monday Night Raw or Sunday Night Heat) and WWF was pushing this album hard for them. WWF also debuted supposed Motley Crue “bodyguard” Test at the same time and tied it into this. I seem to remember this era for Motley being hyped as a return to form for them (despite the fact that they were only promoting their past). We had the original members, but Generation Swine bombed with it’s experimental modern sound, so they put out a greatest hits and recorded two new songs to prove to the world they could still rock ‘n’ roll! The two news songs, “Enslaved” and “Bitter Pill”, are pretty good, IMO, and wouldn’t sound out of place on Dr. Feelgood. They won’t go down as all-time Motley classics, but I still liked’em alot back in the day and I still do. The remix of “Glitter” is my preferred take over the original version from Generation Swine. All in all, a solid greatest hits (though it ignores the 1994 album), but I’m a stickler for greatest hits compilations going in chronological order and this one is all over the place. I always thought the cover was pretty cool though. 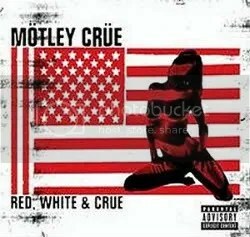 If you want a grew overview of Motley though, go with Red, White & Crue. I plan on upgrading to that one at some point because it covers more songs, features the two new songs found here, AND includes 3 other new songs. Highlights: Um… It’s a greatest hits compilation.